A hospital wants to know how a homeopathic medicine for depression performs in comparison to alternatives. They adminstered 4 treatments to 100 patients for 2 weeks and then measured their depression levels. The data, part of which are shown above, are in depression.sav. Before running any statistical test, always make sure your data make sense in the first place. In this case, a split histogram basically tells the whole story in a single chart. We don't see many SPSS users run such charts but you'll see in a minute how incredibly useful it is. The screenshots below show how to create it. In step below, you can add a nice title to your chart. We settled for “Distribution BDI per Medicine”. Clicking Paste results in the syntax below. Running it creates our chart. *Run histograms of BDI scores for the four medicines separately. All distributions look plausible. We don't see very low or high BDI scores that should be set as user missing values and the BDI scores even look reasonably normally distributed. 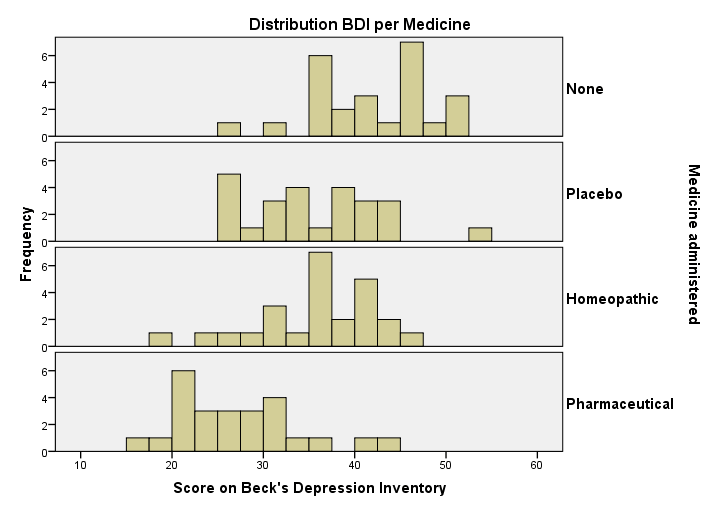 The medicine “None” results in the highest BDI scores, indicating the worst depressive symptoms. “Pharmaceutical” results in the lowest levels of depressive illness and the other two treatments are in between. The four histograms are roughly equally wide, suggesting BDI scores have roughly equal variances over our four medicines. We'll now take a more precise look at our data by running a means table. We could do so from Analyze Compare Means Means but the syntax is so simple that just typing it is probably faster. /cells count min max mean variance. *Note: use /cells to choose which columns you'd like in which order. Unsurprisingly, our table mostly confirms what we already saw in our histogram. Note (under “N”) that each medicine has 25 observations so these two variables don't contain any missing values. So can we conclude that “Pharmaceutical” performs best and “None” performs worst? Well, for our sample we can. For our population (all people suffering from depression) we can't. The basic problem here is that samples differ from the populations from which they are drawn. If our four medicines perform equally well in our population, then we may still see some differences between our sample means. However, large sample differences are unlikely if all medicines perform equally in our population. For an outstanding explanation of this reasoning, read up on ANOVA - What Is It? The question we'll now answer is: are the sample means different enough to reject the null hypothesis that the mean BDI scores in our populations are all equal? we first test if all means are equal. This is often called the omnibus test. “Omnibus” is Latin for “about everything”. if we conclude that not all means are equal, we sometimes test precisely which means are not equal. This involves post hoc tests. “Post hoc” is Latin for “after that” in which “that” refers to the omnibus test. Right? is “statistically significant”. However, it could be argued that you should always run post hoc tests. In some fields like market research, this is pretty common. Reversely, you could argue that you should never use post hoc tests because the omnibus test suffices: some analysts claim that running post hoc tests is overanalyzing the data. Many social scientists are completely obsessed with statistical significance -because they don't understand what it really means- and neglect what's more interesting: effect sizes and confidence intervals. In any case, the idea of post hoc tests is clarified best by just running them. But before doing so, let's take a quick look at the assumptions required for running ANOVA in the first place. Normally distributed variables in the population seems reasonable if we look at the histograms we inspected earlier. Besideds, violation of the normality assumption is no real issue for larger sample sizes due to the central limit theorem. Homogeneity means that the population variances of BDI in each medicine group are all equal, reflected in roughly equal sample variances. Again, our split histogram suggests this is the case but we'll try and confirm this by including Levene's test when running our ANOVA. There's many ways to run the exact same ANOVA in SPSS. Today, we'll go for General Linear Model because creates nicely detailed output. We'll briefly jump into Post Hoc and Options before pasting our syntax. The post hoc test we'll run is Tukey’s HSD (Honestly Significant Difference), denoted as “Tukey”. We'll explain how it works when we'll discuss the output. “Estimates of effect size” refers to partial eta squared. “Homogeneity tests” includes Levene’s test for equal variances in our output. *ANOVA syntax with Post Hoc (Tukey) test, homogeneity (Levene's test) and effect size (partial eta squared). Levene’s Test checks if the population variances of BDI for the four medicine groups are all equal, which is a requirement for ANOVA. As a rule of thumb, we reject the null hypothesis if p (or “Sig.”) < 0.05. In our case, p = 0.949 so we do not reject the null hypothesis of equal variances (or homogeneity). We assume the population variances are all equal so this ANOVA assumption is met by our data. The table below reports the aforementioned ANOVA omnibus test. Our null hypothesis is that the population means are equal for all medicines adminstered. P (“Sig.”) = 0.000 -way less than 0.05- so we reject this hypothesis: the population means are not all equal. Some medicines result in lower mean BDI scores than other medicines. The different medicines administered account for some 39% of the variance in the BDI scores. This is the effect size as indicated by partial eta squared. Partial Eta Squared is the Sums of Squares for medicine divided by the corrected total sums of squares (2780 / 7071 = 0.39). Sums of Squares Error represents the variance in BDI scores not accounted for by medicine. Note that + = . So far, we only concluded that our four population means being all equal is very unlikely. So exactly which mean differs from which mean? Well, the histograms and means tables we ran before our ANOVA point us in the right direction. However, we'll try and back that up with a more formal test: Tukey’s HSD as shown in the multiple comparisons table. Statistically significant mean differences are flagged with an asterisk (*). For instance, the very first line tells us that “None” has a mean BDI score of 6.7 points higher than the placebo -which is quite a lot actually since BDI scores can range from 0 through 63. As a rule of thumb, “Sig.” < 0.05 indicates a statistically significant difference between two means. A confidence interval not including zero means that a zero difference between these means in the population is unlikely. Obviously, , and result in the same conclusions. So far, so good: we ran and interpreted an ANOVA with post hoc tests. However, the tables we created don't come even close to APA standards. We can run a much better table with the CTABLES syntax below. Honestly, I'm not sure how -or even if- it could be created from the menu but you can hopefully reuse it after just replacing the 2 variable names. *APA ANOVA table - means, SD's and Bonferroni corrected pairwise t-tests. /comparetest type = mean style = simple merge = yes. *Note: running this requires SPSS custom tables license. First off, the capitals in this table (A, B and so on) indicate which means differ. SPSS also flags standard deviations and sample sizes. This is utter stupidity because these are not compared. They always have the same flags as the means. So just ignore everything except the actual means here. Understanding this table starts with carefully reading its footnotes. First off, “two-sided tests” refers to independent samples t-tests using 2-tailed significance. 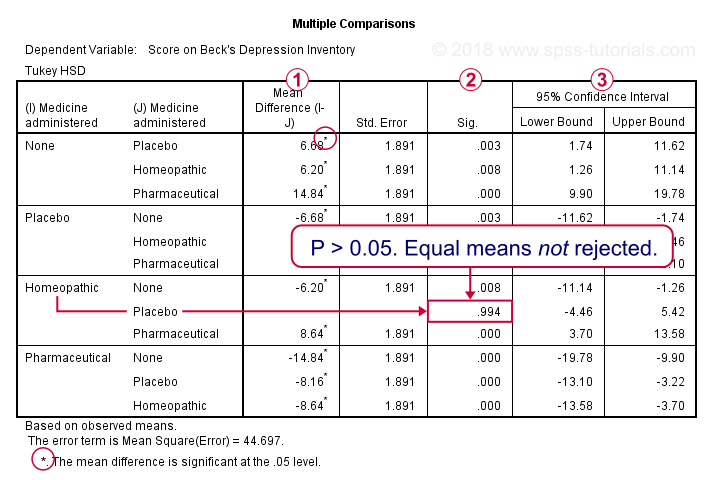 Next, each statistically significant difference is indicated only once in this table. As indicated before, 4 means yield 6 unique pairs of means. Altogether, the table has 5 significance markers (A, B and so on). This means that only (6 - 5 =) only 1 pair of means do not differ. After some puzzling these turn out to be homeopathic versus placebo. This is the exact same conclusion we drew earlier from our pairwise comparisons (Tukey’s) table. So that's it for now. I hope this tutorial helps you to run ANOVA with post hoc tests confidently. If you have any suggestions, please let me know by leaving a comment below. In this table, each column contains means that don't differ significantly. However, it holds the same information as the multiple comparisons table so you can safely ignore it. IMHO, it's a less nice way to report the same test results. When you run Tukey post hoc test you get a homogeneous subset table. How do you interpret it? Thanks for the compliments! The older material is mostly run on SPSS 22. I've been on SPSS 24 for some 2 years and the most recent material uses SPSS 25. Hello, nice work! Would be fine to know which version of SPSS you are working with.